I don’t have the statistics outside of the auto industry to back it up, but I’m pretty sure Canadians are less brand sensitive than Americans. Take Kia, a brand that celebrated its 74th birthday in December of 2018 yet has only been part of the Canadian automotive landscape since 1999, and the U.S. market since 1994. Yet despite a five-year advantage south of the 49th, and having invested in research and design centres in Ann Arbor, Michigan, California City and Irvine, California, plus a assembly plant in West Point, Georgia where the very Sorento that’s now in our garage has been produced alongside the Optima mid-size sedan, and the Hyundai Santa Fe, since 2010, the just noted made-in-America SUV ranked a mere 10th in popularity amongst U.S.-market mid-size SUVs at the close of 2018, compared to fourth place here in Canada as of Q3 2018. What’s more, the Sorento is second most popular amongst SUVs that can seat seven, second amongst import brands (the other being the aforementioned Santa Fe that rides on the same platform architecture, which means it sells better than every Japanese nameplate), and first amongst three-row imports. 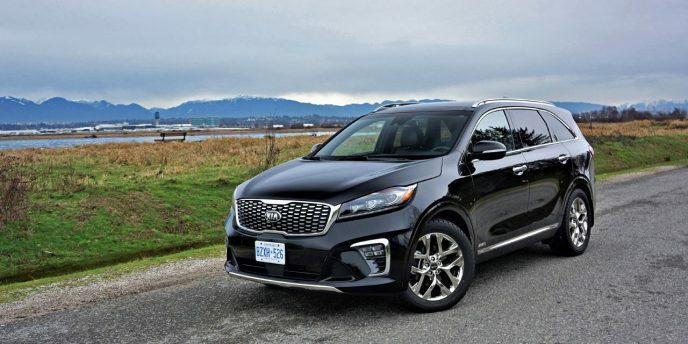 Canadians roughly bought 60 percent more Sorentos in Canada per capita, and where the Santa Fe is number one here it sits ninth there. Similar stories can be found with other models in this category, which all go to corroborate my theory that Canadians are less brand-motivated than Americans, and appear to be driven more by quality and value. Feel free to assume this has something to do with a collective integrity-based ethos or some other positive attribute naturally bestowed upon Canadians, but it likely has more to do with being overtaxed at all levels of government, the latter which are even run more poorly than those in the U.S., especially with respect to fiscal management, leaving us with much less spending power than our friends to the south. More expendable income means they have the luxury of wasting some on higher priced brands, where in contrast we Canadians need to make sure our more highly depreciated dollars are spent as wisely as possible. Enter the Kia Sorento. If you think by this intro the Sorento somehow offers less luxury than its contemporaries, let me set the record straight. Since 2002, when the first Sorento hit the market, it’s been a driving force behind mainstream volume-branded crossover SUV improvement. This could be said for most every Kia, but it’s especially true in this priciest category, which allows all participants to dress up their entries near premium levels in top-line trims. It just so happens the 2019 Sorento sitting in our driveway this week is outfitted in top-tier SXL trim, meaning that it not only comes with soft-touch surfacing in all the expected places, but boasts fabric-wrapped roof pillars from front to back. Such refinements are normally kept privy to the luxury class, but Kia breaks the rules in this respect and others in order to pamper Sorento occupants to a greater degree. This being an “In Our Garage” story, any detail about comfort, quality and usability will be left for a full road test review, but suffice to say the Sorento still measures up to some of its newest mid-size SUV challengers despite hardly being the freshest entry in its class, this third-generation Sorento introduced to North Americans at the beginning of 2015 as a 2016 model, making it five calendar years and four model years into its run. That it receives a subtle facelift this year makes us believe this current generation will be around for another year or two before a complete redesign arrives. The changes include some styling tweaks to the grille, hood, headlights and rest of the front fascia, plus the taillights, rear bumper and of course its various wheels, while inside it gets a new steering wheel, reworked gauge cluster, updates to the centre stack and infotainment system, the latter now including standard Apple CarPlay and Android Auto, new optional wireless smartphone charging, plus more, while newly available advanced driver assistance system features now include lane keeping assist and driver attention warning. 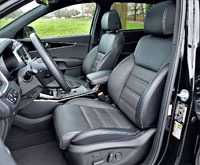 The lower console appears carryover as does its shift lever, but just below is an all-new eight-speed automatic in upgraded 3.3-litre V6 equipped Sorentos, this engine/transmission combination available in base LX and mid-grade EX trims, or standard with the EX Premium, SX and as-tested SXL. The base 2.4-litre four-cylinder engine and its six-speed automatic remain unchanged, but take note that last year’s 2.0-litre turbocharged four-cylinder has been dropped, as has Kia’s promise to provide a diesel, the latter following a trend away from oil burners and toward plug-in hybrid electric or full EVs for alternative powertrains, and the former going against current trends that sees smaller displacement turbocharged engines replacing V6 power. In fact, the all-new 2019 Hyundai Santa Fe, which rides on a new architecture the next-gen Sorento will eventually adopt, uses the same 2.4-litre four-cylinder base engine, making an identical 185 horsepower and 178 lb-ft of torque, and sporting the same 3.3-litre V6 with 290 horsepower and 252 lb-ft of torque in its larger three-row Santa Fe XL model, but the latter SUV hasn’t changed one iota from the previous generation, even keeping its comparatively archaic six-speed autobox, so it’s old tech in an old model. The 2.0-litre turbo is the top-line engine in the five-passenger Santa Fe, and interestingly makes 5 fewer horsepower than in last year’s Sorento at 235, yet identical torque at 260 lb-ft. The elimination of Kia’s 2.0-litre turbo is therefore a strange move, but a move up to a more efficient eight-speed automatic for the optional V6 is certainly welcome. No doubt Sorento buyers helped make the choice for Kia, being that the V6 provides plentiful power and doesn’t overly tax fuel economy with a new claimed rating of 12.5 L/100km in the city, 9.7 on the highway and 11.2 combined, which compares reasonably well to last year’s V6/AWD Sorento in city yet oddly loses ground on the highway, which makes a personal ask exactly what Kia used the new eight-speed’s two final gears for? The outgoing Sorento V6/AWD managed 13.2 L/100km in the city, 9.3 on the highway and 11.4 combined, incidentally. In case you were wondering how well the old 2.0-litre turbo did in comparison, it managed an estimated 12.3 city, 9.4 highway and 11.0 combined, whereas that engine mated up to an eight-speed auto in the new 2019 Santa Fe is good for 12.3, 9.8 and 11.2 respectively—yes, go figure. How about the base 2.4? With its base FWD driveline (that few will buy) it manages 10.7 city, 8.2 highway and 9.5 combined, which despite no changes represents a massive improvement to city mileage over last year’s Sorento with the same powertrain that could only muster 11.2 L/100km city, 8.3 highway and 9.9 combined—it must come down to modifications to gear ratios—while the 2019 Sorento with its 2.4 AWD combination is claimed to be good for 11.2 city, 9.0 highway and 10.2 combined now, compared to 11.5, 9.3 and 10.5 last year. As noted, most won’t choose front-wheel drive in Canada despite few needing it on the urban West Coast and most FWD sales occurring in snowbound Quebec, this latter choice reportedly due to Quebecois family budgetary challenges, that really shouldn’t be as tight due to free daycare services, but nothing much makes sense in Canada these days. For the rest of Canadians, as mentioned before, AWD comes standard on trims above the base LX and mid-range EX. As tempting as it would be to rattle off every standard and optional feature available to 2019 Sorento buyers, because it would clearly show the model’s value proposition over comparatively sized competitors that are all priced higher, a shorter list of unusually impressive features would tax minds and memories less, so for starters the base LX comes standard at just $27,995 (an identical MSRP to last year) with 17-inch alloy wheels, auto on/off projector headlamps, chromed door handles, a leather-wrapped multifunction heatable steering wheel, Drive Mode Select with default Comfort, Eco, Sport and Smart settings, three-way heated front seats, a 7.0-inch infotainment display with aforementioned Apple CarPlay, Android Auto and a backup camera, six-speaker audio, and more. Adding AWD to the base LX increases the price by $2,300 to $30,295 yet also provides roof rails, proximity-sensing access with pushbutton ignition and a wireless phone charger, while the same trim with the V6 and AWD increases the base price by $4,500 to $34,795 and increases content to include fog lamps, a sound-reducing windshield, turn signals integrated within the side mirror caps, an auto-dimming rearview mirror, dual-zone automatic climate control with auto-defog, UVO Intelligence connected car services, satellite radio, an eight-way power-adjustable driver’s seat with two-way powered lumbar support, a third row for seven-occupant seating, trailer pre-wiring, and more. For $2,300 less than the LX V6 AWD and $2,200 more than the LX AWD, four-cylinder-powered $32,495 EX 2.4L trim includes the just noted fog lamps, powered driver’s seat, and seven-passenger capacity of the six-cylinder model while adding a glossy grille insert and leather upholstery, whereas the $38,365 EX with the V6 and AWD builds on the both the LX V6 AWD and EX 2.4 with 18-inch machined-finish alloy wheels, an upgraded Supervision LCD/TFT instrument cluster, express up/down powered windows with obstacle detection all-round, a household-style 110-volt power inverter, and blindspot detection with rear cross-traffic alert, while EX Premium trim starts $2,500 higher at $40,865, yet adds such luxuries as front and rear parking sensors, power-folding side mirrors, LED interior lighting, an eight-way powered front passenger’s seat, a panoramic glass sunroof, rear door sunshades, a powered liftgate with smart access. 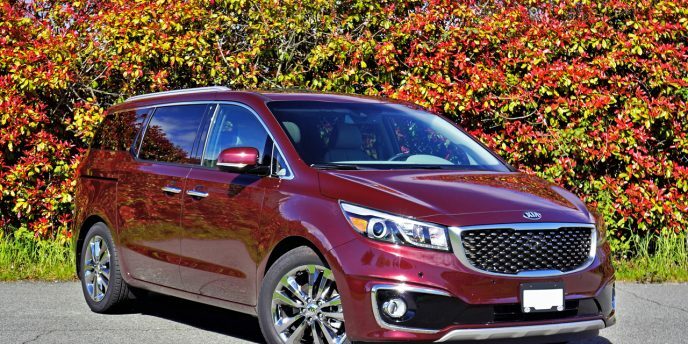 Those wanting to step up to a true luxury experience that rivals some premium brands can opt for the Sorento SX that, for $4,000 more than the EX Premium at $44,865, provides most everything already mentioned plus 19-inch alloys, a chrome grille, stainless steel skid plates front and back, a stainless steel exhaust tip, chromed roof rails, dynamic directionally-adaptive full LED headlights, upgraded LED fog lamps, bar type LED taillights, sound-reducing front side glass, illuminated stainless steel front door scuff plates, perforated premium leather upholstery, a larger 8.0-inch infotainment touchscreen with navigation, 10-speaker Harman/Kardon premium audio, ventilated front seats, heated rear outboard seats, and more. Lastly, the Sorento SXL in our garage adds another $4,000 for an asking price of $48,865 before freight and fees, which incidentally is still quite a bit less than most fully loaded rivals, some of which don’t even offer the level of high-grade equipment included in the previous trim, but this SXL grade adds unique 19-inch chrome alloy wheels, softer Nappa leather upholstery, chrome side sill accents, an electromechanical parking brake, a 360-degree surround parking camera, and a host of advanced driver assist systems such as high beam assist headlights, adaptive cruise control, forward collision-avoidance assist, plus aforementioned lane keeping assist and driver attention alert. For all trims, options packages, standalone upgrades, available colours and more, plus otherwise difficult to find rebate information and dealer invoice pricing that could save you thousands, visit CarCostCanada now. So much has changed within North America’s small car categories over the past couple of years, with all three domestic automakers giving up on conventionally powered subcompact and compact sedans and hatchbacks altogether, leaving Japanese, Korean and German carmakers to fight over the still sizeable scraps. Kia and its parent Hyundai collectively own the subcompact segment with their Rio and Accent selling 19,371 units in 2017, and Seoul only narrowly missed out beating Honda in the larger compact segment. Last year the two Korean brands managed 67,145 compact units to Honda’s 69,030, and while the spread widened during the first nine months of 2018 with Kia and Hyundai managing just 47,978 Forte, Rondo, Elantra, Veloster and Ionic deliveries to Honda’s 56,206 Civics and Insights, the latter number lower than expected because of flooding at the Japanese brand’s Celaya, Mexico Insight plant, they’re still much further ahead than the rest of the pack. The third-place Corolla (Family) sedan and Hatchback found 50,332 buyers last year and 37,900 so far this year, but Toyota’s compact numbers don’t add up fairly due to the way the automaker combines all Prius sub-brand sales numbers (made up of the subcompact Prius C, compact Prius and Prius Prime plug-in, plus the mid-size Prius V) into one Prius Family, and while it’s safe to say the regular Prius makes up the majority of the three models’ 7,977 collective sales last year and 7,241 so far this year, we can’t be sure. Then again, even if we lumped all Prius sales with all Corolla sales it would still only total 58,309 in calendar year 2017 and 45,141 as of Q3 2018, which remains behind Hyundai/Kia. Incidentally, it took VW four models and multiple body styles to achieve 43,469 sales in 2017 and 30,053 as of Q3 2018; it took Chevrolet two models to manage 31,833 deliveries last year and 25,468 over the first nine months of 2018 (the Cruze and Volt to be discontinued as noted); Mazda beat Cruze sales with 27,862 Mazda3s in 2017 yet fell slightly behind with 21,164 through to the third quarter of 2018 (when including the Mazda5 mini-minivan the Japanese brand’s compact sales rose to 30,086 units in 2017 and 21,794 over nine months of 2018); Subaru’s compact sales dipped slightly to 15,233 Impreza/WRX/STI models last year, but were on a tear as of Q3 2018 with 14,359 already sold (Impreza sales having already surpassed 2017 totals); likewise, Nissan’s Sentra and Leaf were lower at 14,829 units in 2017 yet already at 14,540 after nine months of 2018; Ford’s 11,937 Focus sales last year and 8,230 as of Q3 2018 show why it’s a good idea to update your models more often (with the similarly cancelled C-Max those numbers grew to 13,351 and 8,436 units respectively); Mitsubishi’s 5,754 Lancer deliveries through 2017 and 2,012 over three quarters of 2018 make their survival through the next recession seem challenging at best; and just in case you were wondering what happened to the Dodge Dart, FCA delivered a measly 533 through 2017 and a grand total of 4 so far this year (no doubt the final four). As for the split of Forte and Elantra sales, as you may have guessed the parent brand sold many more of the latter with 46,112 rolling off the showroom floor in 2017 and 33,456 over the first nine months of 2018, while the Forte’s numbers were 16,388 and 10,823 respectively, and while this looks as if Kia is lagging behind its rivals take note that it was only narrowly beaten by the aforementioned Subaru Impreza while managing to edge out the Nissan Sentra and Volkswagen Jetta, two big players in other markets. The Forte also handily outsold the Focus, the Prius Family, and plenty of other models that were mostly mentioned already. Even more importantly, where most others in this class are losing ground the Forte saw its strongest sales ever last year, with a 33.3 percent gain over 2016, and is on target for a better than average 12 months this year. The only other compact to show sizeable growth from calendar year 2016 through 2017 was the VW Golf, with sales up 15.9 percent, while the Honda Civic saw a 6.9 percent gain, Toyota Corolla Family sales increased by 4.4 percent, the Chevy Cruze grew its numbers by 2.6 percent (only because it lost 16 percent from 2015 to 2016), and the Mazda3 nudged itself upwards by 0.6 percent. 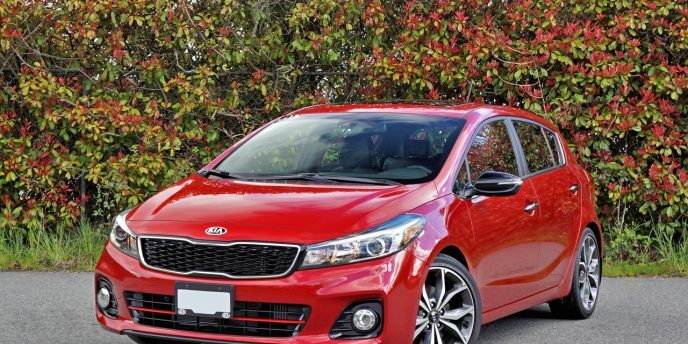 Why all the Kia Forte sales growth? With every new generation the Forte becomes notably better, even so much that it passes right by most of its peers in styling, interior fit, finish and materials quality, standard and optional features, and drivability. This entirely new from the ground up third-generation 2019 Forte is the best it’s ever been, with styling that manages to conjure thoughts of sophisticated European machinery (much thanks to its mostly European-staffed design department), a much-improved cabin with new digital interfaces, plenty of normally pricey standard features and Kia’s usual unbeatable assortment of options, plus a fresh new transmission. The sole 2.0-litre four-cylinder engine remains a carryover of last year’s base mill, which is still good for 147 horsepower and 132 lb-ft of torque, and while a six-speed manual gearbox can still be found in the entry-level LX, that trim now gets the option of a Hyundai/Kia-developed continuously variable transmission (CVT) instead of last year’s six-speed automatic—the CVT standard with all other trims. I’ll report on its performance and refinement in my upcoming road test review, plus I’ll talk about ride quality, handling, and everything else normally covered. 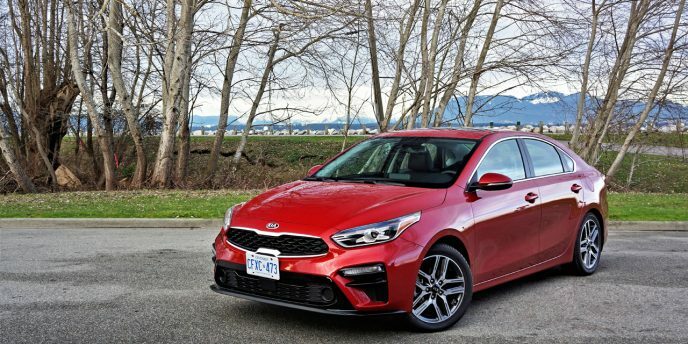 The CVT is a $2,500 upgrade over the base six-speed manual, moving the price up from $16,495 to $18,995 plus freight and fees (make sure to check out complete 2019 Kia Forte pricing of all trim levels, packages and options at CarCostCanada, plus rebate info and dealer invoice pricing that could save you thousands), but along with automatic operation you also get standard Drive Mode Select with default, Eco, Sport and Smart driving modes, plus some advanced driver assistance systems including Forward Collision-Avoidance Assist (FCA), Lane Keeping Assist (LKA), and Driver Attention Alert (DAA), while both LX models also include auto on/off projector headlamps, splash guards, body-colour mirror caps and door handles, heated side mirrors, a heatable leather-wrapped steering wheel, heated front seats, a leather-wrapped shift knob, air conditioning, a new fixed tablet-style 8.0-inch touchscreen infotainment display with Apple CarPlay and Android Auto smartphone integration and a rearview camera with dynamic guidelines, 60/40 split-folding rear seatbacks, USB audio input and charging ports, AM/FM/MP3 radio, Bluetooth hands-free connectivity with audio steaming, cruise control, Hill-Assist Control (HAC) plus all the expected active and passive safety features. If you want 16-inch machined-finish alloys instead of 15-inch steel wheels with covers you’ll need to upgrade to $20,995 EX trim, which also includes LED headlamps, LED daytime running lights, LED positioning lights, turn signals integrated within the side mirror housings, a gloss black grille with chrome accents, chrome window trim, aeroblade wipers, a chrome exhaust tip, satin chrome interior door handles, a supervision LCD/TFT primary instrument cluster, a wireless device charger, rear climate ventilation, a rear centre armrest, tire pressure monitoring, and Blind Spot Detection (BSD) with Rear Cross Traffic Alert (RCTA). The move up to $22,495 EX+ trim adds a 17-inch machined-finish alloy wheels, LED taillights, LED interior lighting, and a powered moonroof, whereas $25,065 EX Premium trim also includes High Beam Assist (HBA) for the aforementioned LED headlights, proximity-sensing access with pushbutton ignition, adaptive cruise control, an eight-way power adjustable driver’s seat, SOFINO synthetic leather upholstery, satellite radio, UVO Intelligence connected car services, a Smart release trunk that automatically opens when you’ve been standing behind it for three seconds with the key fob in your pocket or purse, Advanced Forward Collision-Avoidance Assist (FCA), and more. Lastly, my $28,065 EX Limited tester came with everything already mentioned as well as ventilated front seats, heatable outboard rear seats, an upgraded multimedia infotainment interface with integrated navigation, and Harman/Kardon premium audio. Of course, I’ll go on at length about the capability of this sound system, the upgraded infotainment system and all other features in my future review, plus along with my road test notes I’ll be filling you in on achieved fuel economy, the new CVT helping the upgraded Forte achieve a better rating of 7.7 L/100km city and 5.9 highway compared to 8.0 and 6.1 respectively. Kia must have rejigged the manual too, because its claimed rating is now 8.6 city and 6.4 highway compared to 9.4 and 6.8, but that’s not the real oddity at play here. Strangely, the 2.0-litre four that’s pulled forward from last year’s car is actually the lesser of two powertrains available in 2018, the more advanced direct-injected optional engine capable of 164 horsepower and 151 lb-ft of torque. This may be due to a late arrival option set to arrive along with a redesigned Forte5, the model’s five-door hatchback variant still suited up in its previous design and being sold as a 2018. The Forte5 currently uses the upgraded engine for its base powerplant, while offering a turbocharged 1.6-litre four making 201 horsepower and 195 lb-ft of torque in a performance SX trim. Kia is no stranger to electrified vehicles. It currently offers the Optima Hybrid in both regular and plug-in varieties, the fully electric Soul EV that’s just been redesigned for 2019, so therefore nobody should be surprised to see the new Niro subcompact crossover show up in HEV guise. The surprise is its dedicated hybrid powertrain. Yes, that means it isn’t offered with conventional gasoline-only propulsion at all. This is reason enough for it being compared to the Toyota Prius, with some even considering it a Prius competitor. While such may be true in the context of its hybrid drivetrain, directly challenging the Prius is really the job of Hyundai’s equally dedicated Ioniq, which while sharing the same fully independent underpinnings, the identical 1.6-litre Kappa III four-cylinder Atkinson-cycle powerplant, a duplicate of its six-speed dual-clutch automated transmission, and direct copies of its electrified components, the Ioniq is shaped more like a traditional hatchback, is quite a bit longer, and sits a lot lower to the ground overall. Instead, the shorter, taller Niro is sized almost identically to the new Toyota C-HR and slightly longer Nissan Qashqai, which are two of the larger subcompact SUVs available. This said the Niro is quite wide, coming closer to matching Subaru’s Crosstrek. Either way the Niro fits nicely within this smallest of SUV categories, which is an ideal place for a new hybrid to reside as it provides an excellent opportunity for sales growth. 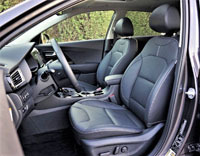 You’ll have to decide for yourself if the thick matte black trim around the wheel cutouts and additional slabs of black protective trim skirting the rest of the Niro’s lower extremities provide enough SUV-like machismo for its Kia-applied crossover categorization, or whether its satin-silver roof rails and other exterior detailing enhance or detract from that effect. Likewise, you’ll need to take it for a drive to find out if its slightly raised ride height allows enough visibility of the road ahead and surrounding area to make you feel like you’re at the wheel of a sport utility, but then again the popularity of the aforementioned Qashqai, which is now the subcompact crossover SUV segment’s best-selling model and hardly anymore truck-like, proves that tough, rugged styling and a tall profile aren’t the only elements of success in this class. SUV-ness aside, the idea of combining a small crossover with a hybrid drivetrain is pretty smart. It’s hardly an original ideal, Toyota having found plenty of success implementing this formula with in its larger RAV4 Hybrid in the compact SUV category, and Mitsubishi slightly less so with its similarly sized Outlander PHEV, but the Niro is a first for the smaller entry-level subcompact SUV segment, and the fact that it’s the first dedicated hybrid within the crossover SUV sector is actually groundbreaking. Another thing the Niro has going for it is price. 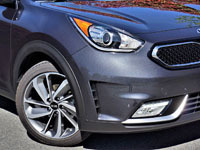 A base 2018 Niro L can be had for as little as $24,995 plus freight and fees (see full 2018 Niro pricing at CarCostCanada, plus money saving rebate info and dealer invoice pricing that could save you thousands), which is quite reasonable even without factoring in its hybrid drivetrain that normally costs thousands over a given model’s conventionally powered alternative. Still, you get this super-efficient HEV in base trim with standard 16-inch alloy wheels, perimeter/approach lights, auto on/off projector headlamps, LED DRLs, LED positioning lights, fog lamps, splash guards, variable intermittent wipers, a tilt and telescopic steering column, a heatable leather-wrapped multifunction steering wheel, a large colour TFT multi-info display, distance pacing adaptive cruise control, a leather-clad shift knob, illuminated vanity mirrors, filtered dual-zone automatic climate control with auto defog, three-way heated front seats, an overhead sunglasses holder, cloth upholstery, chrome/metal-look interior accents, a cargo net, a hill holder, individual tire pressure monitoring, a perimeter alarm, all the usual active and passive safety features including a driver’s knee airbag, and more. 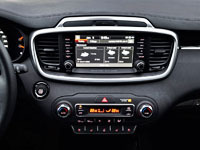 Continuing with the Niro’s impressive value theme, base L trim also comes standard with a 7.0-inch infotainment touchscreen featuring a rearview camera, Apple CarPlay and Android Auto smartphone integration, six-speaker audio, AM/FM/MP3/satellite radio, Bluetooth phone connectivity with audio streaming, USB and aux ports, etcetera. 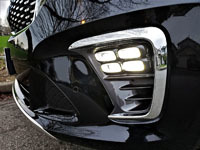 If you want more than mere base trim, and most Canadians do, the $27,595 Niro EX adds LED turn signals onto an upgraded set of power-folding side mirrors, sharp looking and quicker responding LED taillights, those roof rails mentioned earlier, plus proximity-sensing access with a pushbutton ignition, an auto-dimming rearview mirror, rear parking sensors, a wireless phone charger, upgraded cloth and leather upholstery, piano black lacquered interior trim, coloured console and door panel inlays, satin chrome inner door handles, a folding rear centre armrest, rear climate ventilation, a cargo cover, an under floor storage tray, and more. 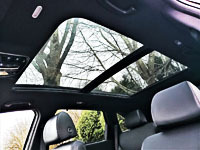 If you think that’s good, a tiny hop up to the $29,195 EX Premium adds a powered glass sunroof, an eight-way power-adjustable driver’s seat with two-way powered lumbar, and blind spot detection with rear cross-traffic alert. Leaving the best to the last, my top-line $32,995 Niro SX Touring included most everything already mentioned as well as better looking 18-inch alloys, brighter HID headlamps, aeroblade wipers, “niro” inscribed metal door sill treadplates, alloy sport pedals, a larger 8.0-inch touchscreen with a navigation system featuring detailed mapping, front parking sensors, a great sounding eight-speaker Harman/Kardon audio system, stylish perforated leather upholstery, a household-style 110-volt power inverter, driver’s seat memory, ventilated front seats, heatable rear seats, emergency autonomous braking, lane departure warning, lane keeping assist, stop and go added to the distance pacing adaptive cruise control, driver attention alert, and more. It all comes in a really nicely finished cabin that’s suited up more impressively than some premium branded subcompact crossover SUVs, highlighted by a high-quality soft-touch synthetic dash top and door uppers. My Graphite painted Niro SX Touring looked stealth compared to those coated in Ocean Blue or Temptation Red, while other exterior colours include a darker, greyer Gravity Blue, Espresso brown, Snow White Pearl, and Aurora Black, with all SX Touring models receiving black leather upholstery within an all-black interior. Of course it’s not completely black inside, thanks to sporty white contrast stitching throughout, and two above average quality high-resolution electronic displays ahead of the driver and another on the centre stack, these filled with deep, rich colours and attractive graphics. 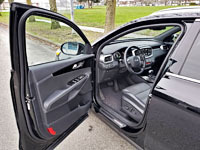 Before I delve into these interfaces, the Niro SX Touring driver’s seat is comfortable and the all-round view is quite good thanks to a reasonably tall ride height, the Niro bridging the aforementioned gap between crossover SUV and tall wagon quite well. The previously noted power seat controls provided plenty of adjustment and the fore-and-aft-only powered lumbar support fit my lower back ideally, as did the entire backrest. Comfort in mind, the steering column offers a lot of telescopic reach, which I happen to appreciate because this benefits my long-legged, shorter torso five-foot-eight body type, while there’s also plenty of rake. The nicely shaped leather-wrapped and black-lacquer adorned steering wheel looks and feels sportier than I expected for a hybridized SUV too, and it comes filled with high quality switchgear including easy-to-use rockers for various functions, particularly for scrolling through and selecting features within the full-colour dual-screen multi-information display mentioned earlier, these defaulting to hybrid-specific info. The analogue gauges are brightly backlit too, with the entire cluster very good looking. The centre stack mounted infotainment interface noted earlier features familiar tablet-style tap, pinch and swipe touchscreen gesture controls, a very clear and easy to see backup camera with active guidelines, navigation with a nicely detailed map and accurate route guidance, plenty of useful apps, and once again unique hybrid info that even goes so far as to show how well you’ve been driving via a dot matrix-style tree which grows more foliage when driven more efficiently. It showed my real-time fuel economy averaging 5.9 L/100km, but to clarify I really wasn’t trying to drive efficiently during my final stint, as I need to get the Niro home quickly. It’s useful info just the same, while eco-geeks will likely enjoy the graphic energy flow display even more. This said I’ll deep dive into fuel economy as I get further into this review, because I don’t want to get pulled out of the Niro’s impressive interior just yet, and I need to preamble the powertrain before that. Having set the driver’s seat up for my aforementioned small-to-medium-build frame, I slid into the back seat more easily than I would in a lower car thanks to its taller ride height, and found a lot of space to move around and get comfortable in. In fact, there were four to five inches between my knees and the front seatback, plus even more above my head, while you shouldn’t have any problem seating three adults side-by-side, although two would be more comfortable. 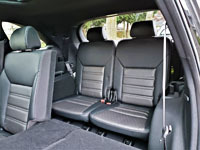 As expected in a crossover SUV albeit not always true of electrified cars, the Niro provides a sizeable cargo hold measuring 635 litres (22.4 cubic feet) behind the 60/40-split rear seatbacks and 1,789 litres (63 cubic feet) when they’re folded flat, which is actually much better than average for the subcompact SUV class. The loading area is nice and wide too, while a folding cargo floor reveals a hidden cargo organizer below, useful for storing valuables, tools or other items you may want to keep separated from everything else. Back in the driver’s seat, a quick press of the dash-mounted button ignites the engine and you’re off to the races. The direct injection-enhanced four-cylinder internal combustion engine (ICE) displaces 1.6 litres resulting in 104 horsepower, but when factoring in the 32-kW (43-horsepower) permanent magnet synchronous electric motor it’s good for 139 net horsepower. Even better, the electric motor adds 86.5 lb-ft of more immediate twist to the ICE’s 108.5 lb-ft of torque, with the combined effect totaling 195 lb-ft of net torque from 4,000 rpm. That’s a lot of get up and go for a subcompact SUV, but the inclusion of the quick-shifting six-speed dual-clutch automated transmission I mentioned earlier (not the humdrum CVT found in most hybrids) makes the Niro feel even sportier. It’s such a great gearbox that I was longing for a set of steering-wheel mounted paddle shifters, but at least Sportmatic manual mode can be actuated via the gear lever, and it works well enough. Another driveline feature I would’ve liked to see is AWD, but despite the Niro targeting the subcompact SUV market the placement of its 1.56-kWh rear-mounted lithium-polymer battery means it won’t be getting all-wheel drive anytime soon if at all. Still, news that Hyundai-Kia is developing in-wheel e-AWD technology gives me hope that it’s not totally out of the question at some point in the future. Some time ago I would’ve said that AWD is a subcompact SUV prerequisite, but it’s long been excluded from the very popular Kia Soul and now can’t be had with the aforementioned Toyota C-HR either, so I suppose AWD isn’t as critical in this category as I initially figured it would be, and the Niro’s fuel economy is so good many won’t care one whit about extra rear-wheel traction. Driving this point home is a great story worth repeating. The Niro was barely born when it earned a Guinness World Book of Record’s entry thanks to Wayne Gerdes and co-driver Robert Winger using just 4.1 tanks of gas while driving their Niro EX 5,979 km (3,715 miles) from Los Angeles to New York City, the key number being an average of 3.1 L/100km (76.6 U.S. mpg). 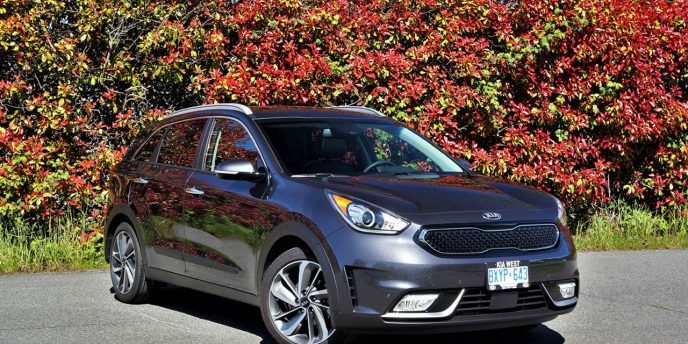 No doubt they were using hypermiling techniques to achieve such incredible efficiency, as the Niro EX trim’s five-cycle Transport Canada rating is a more conservative 4.6 L/100km in the city, 5.1 on the highway and 4.8 combined. The base LX is claimed to do even better with a 4.5 L/100km city, 4.8 highway and 4.7 combined rating, whereas the as-tested SX Touring is good for an estimated 5.1 city, 5.8 highway and 5.4 combined. Like other hybrids Kia uses regenerative braking to recoup kinetic energy, as well as auto start/stop to save fuel that would otherwise be wasted while idling, while standard Drive Mode Select provides an Eco mode to increase efficiencies and therefore reduce emissions further. I actually left it in this greenest of settings for most of my test week due to a generally stingy personal nature, but I must say its alternative Sport mode makes for a more enjoyable driver’s car, providing that extra punch off the line required for quicker takeoff and more confident highway passing. I was actually surprised at how well the Niro drove. Let’s face it. While attractive, its somewhat conservative tall wagon styling prepared me for more of a sheepish experience than running with the wolves, but its formidable power, superb transmission, and nicely dialed in front strut, rear multi-link suspension rolling on meaty as-tested 225/45R18 rubber combined for good balance through the corners, while the ride is smooth and once again comfortable. Its lightweight yet rigid construction, made with plenty of high-strength steel and aluminum, adds to its Euro-inspired feel, while its nice taut ride was never rough, the Niro striking a good compromise between sport and comfort that most should appreciate. That last sentence really sums up my entire weeklong experience. I can’t see many disagreeing with Kia’s new Niro, nor its very attractive value proposition. It’s a great little crossover that’s wonderfully comfortable, fully accommodating, filled with premium features, and best of all it delivers record-breaking fuel economy yet doesn’t feel at all like a hybrid. In other words, the Niro is a lot of fun to drive. Whether you’re looking for a good small SUV or a fuel-efficient dedicated hybrid, consider the Niro. It’s a best of both worlds offering that shouldn’t be looked over. Kia has thoroughly refreshed its second-generation Forte5 for 2017, and it even looks better than the already stylish outgoing version. I've long found the Forte an attractive compact, whether in five-door hatchback, four-door sedan, or two-door coupe guise. The coupe, or rather Koup, was discontinued at the end of 2016 in the U.S. and continues unchanged here in Canada, so you'll need to step up to this Forte5 or the Forte sedan in order to enjoy all the improvements. Regular readers will know I've got a thing about minivans. And no, I'm not talking about the usual ego-driven "I won't be caught dead in anything so homespun" attitude that's caused North American families to deviate from this most practical of motive appliances to far less utile car-based pseudo-SUVs in droves, but rather a true appreciation for monobox mobility with side-slider access. That the alt-mainstream brand Kia goes about the Sedona's pragmatic duty with such a keen sense of urbane style is merely a bonus that I exploited during a recent weeklong test.